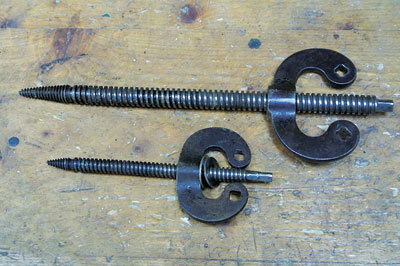 Two traditional carvers screws. I cannot state enough that the screw points have to be correctly engineered! 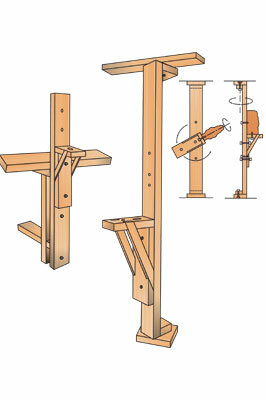 As described in my previous article, the traditional carver's post and bracket is a very practical and inexpensive way of holding your work. They have been around for centuries and were originally the central pillars holding up the roof of the workshop. With the four faces of the pillar accommodating up to four carvers, the master in the prime position could monopolise the excellent north light. There are portable versions fixed on a platform that you can stand on so your body weight secures the post. These are more sophisticated and therefore far more expensive. 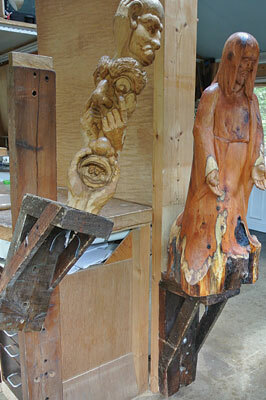 If you are fortunate to have been to the Austrian Woodcarving School, you will be conversant with these. If you do not have the facilities to have a large carver's post, I have a smaller version that can be used in various positions in the workshop, garage or shed that may be fixed against a wall or portable workbench. I generally use it when I do demonstrations. It is very similar to the full length version, but is bolted to the workbench and floor so it is solid and cannot be rotated but may be removed and stored when not required. A traditional part of a carver's kit is the carver's screw - a length of threaded rod with a sturdy, well-engineered, threaded point at one end and a butterfly wing nut located on the other end. 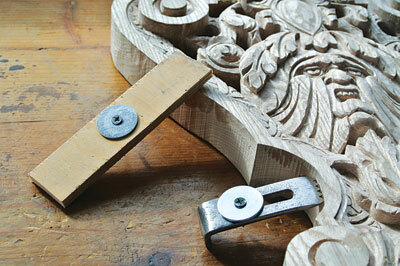 When screwed into a pre-drilled hole in the bottom of the work, the carving may be placed on the bracket or block and rotated and tightened in position by hand, using the butterfly nut. Using a coach bolt would require you to locate a spanner on the head of the bolt to fix the work; this takes time to locate and is clumsy and so, a carver's screw is more efficient. A carver's holdfast provides a very solid way of fixing work in the middle of the bench where clamps cannot reach from the edge of the bench. Its leg is inserted through a larger hole in the bench top, its foot at the end of the arm rests upon the wood that is to be carved; the screw at the other end of the arm is hen tightened onto the end of the leg. The work is held firm by the pressure exerted between the leg and the side of the hole, making the carving rigid, and for this reason it is advisable to use some softening between the foot and the carving. This is excellent for holding irregular-shaped relief work that may have thin, fragile edges. The principle of the holdfast is surprisingly simple and is very efficient and quick to adjust but after use, the hole in the bench needs to be temporarily plugged to stop items falling though. Dogs are two small metal plates, turned up at one end with serrated teeth cut into both ends that grip the side of the carving and the workbench. A screw is placed through the elongated hole and screwed into the bench, securely holding the work. You have to be careful placing the teeth in the side of the carving as damage may occur, but they are fine for square-sided panels. They can be substituted by two strips of wood that are screwed into the bench through a central hole and tightened with one end on the carving and the other end creating pressure from the bench. Most of the time, three-dimensional carvings should be worked in an upright position, replicating how it will eventually be displayed. 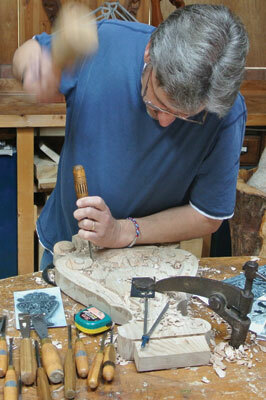 Working carvings on a constantly rotating ball and socket joint confuses the eye as to what is upright. Constantly rotating the work also repeatedly alters the direction of light on your carving and encourages you to work all around the carving which is definitely discouraged. These are not the procedures we follow; the lighting needs to be from a constant direction! Sorry if this advice seems like a soap-box moment, but it's important! The last two articles in this series describe ideal working conditions and I know compromises have to be made, but it may be possible to improvise a small working area in the corner of a spare room or dining room. I was indeed fortunate for 28 years to work for a company formed in 1877 that sustained a professional carver's workshop. For many years I executed my own work in the dining room and then a garage before eventually being able to build my own workshop to a similar commercial design.